Culture and nature have been linked together since small scale salt farming began in the South San Francisco Bay in 1850. I explored these concepts in my Masters Degree thesis in Cultural Resources Management. I regularly speak on these and related topics. 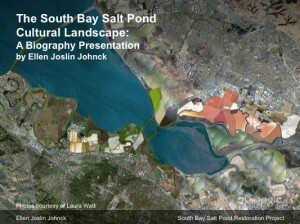 Download a copy of my presentation: The South Bay Salt Pond Cultural Landscape: A Biography Presentation. 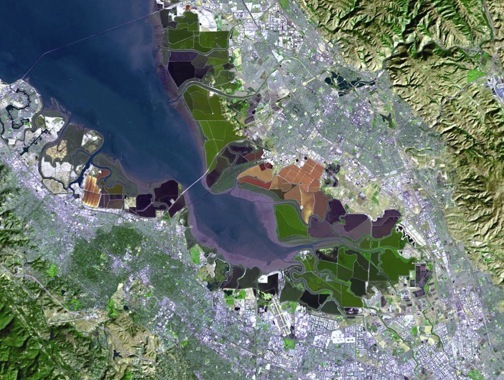 The salt ponds and levees of southern San Francisco Bay are a culturally significant landscape wherein culture and nature have been linked over 150 years of industrial salt production through solar evaporation in an extensive wetland ecosystem. This 15,100-acre landscape is the subject of the South Bay Salt Pond Restoration Project (SBSPRP), the cultural resources of which are receiving scant attention relative to the SPSPRP’s primary resource management goals for wildlife habitat, flood prevention and public recreation. 4) establish a basis for justifying the salt pond landscape’s cultural significance and potential eligibility for listing on the National Register of Historic Places. Research was conducted on the history of the salt production industry and the Bay’s environment, and a general cultural resources survey and inventory were completed. 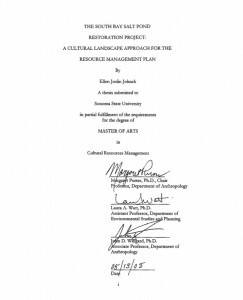 The history of cultural landscape analysis was explored including an academic and government literature review of cultural landscape studies and resource management plans for national and state parks, wildlife refuges, and other types of protected areas such as archaeological, World Heritage and eco-cultural tourism sites. In general there is ample information on methodologies for cultural landscape analysis and heritage tourism planning. While there are several examples where historic and environmental resources have been integrated using the landscape as a unified context for resource management plans, much remains to be done to make effective use of this practice. The cultural landscape analytical framework developed here and when applied to the SBSPRP should yield a more holistic and enriching RMP. Aerial view of the San Francisco Bay salt ponds. I’ve launched this very simple website to provide some key information. We’ll be building this site out over the coming months. Thank you for visiting and don’t hesitate to contact me to discuss your project.